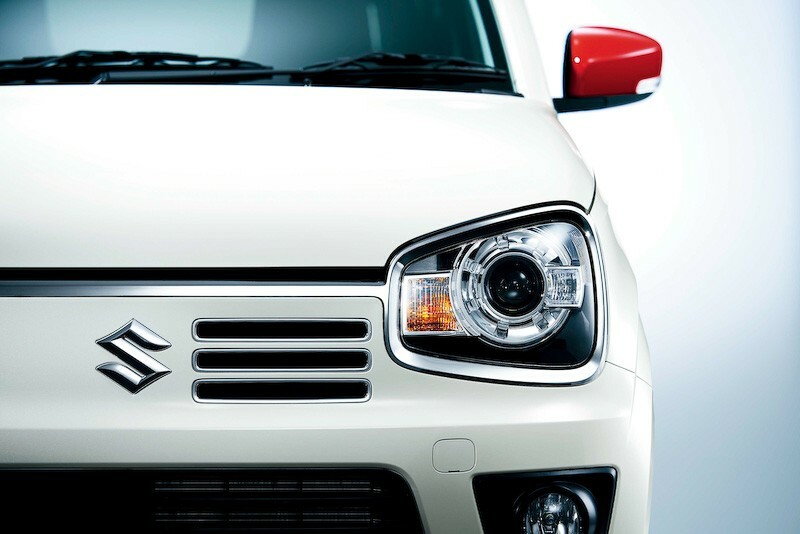 Suzuki Motor Corporation has launched the all-new Alto minicar in Japan on 22 December, 2014. 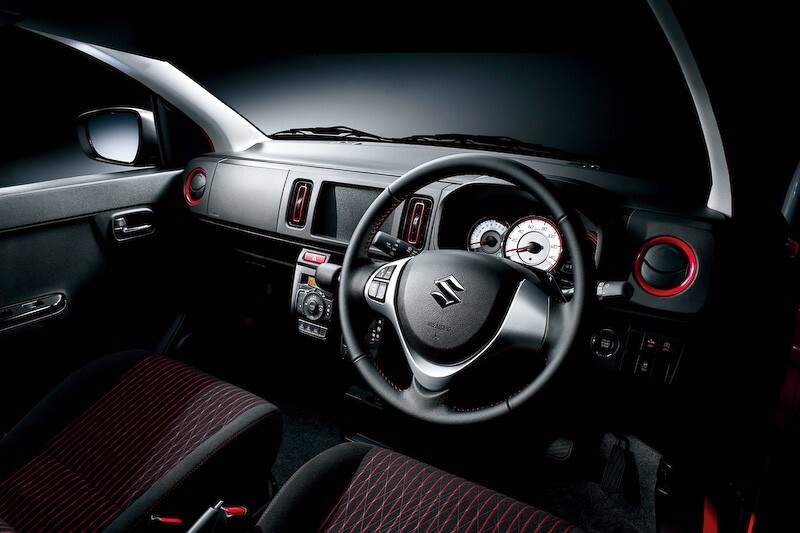 Suzuki has launched the all-new, eighth-generation Suzuki Alto in Japan. Suzuki claims that the eighth-generation model, a Japan-only model, has the lowest fuel consumption among non-hybrid gasoline vehicles in Japan, achieving a fuel economy of up to 37.0 km/l (2WD and CVT). The new Alto is equipped with a 0.6-litre DOHC petrol engine that produces 48 hp or 51 hp and 58 Nm or 63 Nm of torque depending on the transmission opted. There are three transmission options available – a standard 5-speed manual transmission, an improved CVT or the new Auto Gear Shift (AGS). The new model has seen a weight reduction of as much as 60 kg. Alto was first launched in May 1979 in Japan as a utility minicar with the ease of driving and use, economic efficiency, and inexpensive price setting. It became popular mainly among female customers and pioneered a new market for minicars. Since its launch, Alto had evolved in terms of function and performance in line with the needs of the times. Throughout its 35-year history, Alto has been favored by many customers, with its accumulated domestic sales of approximately 4.83 million units*1. It is a model that represents Japanese minicars. The all-new eighth generation Alto has adopted a newly-developed platform for the first time and achieved a weight reduction of 60kg*2 by thoroughly reducing its weight. Along with the enhanced efficiency of the powertrain, it has realized fuel consumption of 37.0km/L*3, the lowest among non-hybrid gasoline vehicle in Japan*4. It also combines light and steady driving performance. While adopting a simple and stylish design with the exterior emphasizing quality and proportion, and the interior combining design and function, it also realizes roomy cabin space with the longest cabin length in its class*5, owing to its stretched long wheelbase. Further, by incorporating advanced safety technologies such as the Radar Brake Support collision-mitigation braking system, the Alto has evolved in fuel efficiency, driving performance, design, and safety performance, while brushing up basic performances including the ease of maneuverability and handling. Combined light and steady driving performance with the lowest fuel consumption among non-hybrid gasoline vehicle in Japan*4 of 37.0km/L*3. Achieved weight reduction of 60kg*2 as compared to the conventional model. Realized the lightest weight*6 of 610kg*7. Simple, clean, and stylish design. Comfortable cabin space with the ease of driving. 1. Combined light and steady driving performance with the lowest fuel consumption among non-hybrid gasoline vehicle in Japan*4 of 37.0km/L*3. Enhanced fuel efficiency and driving performance owing to the adoption of a new platform and 60kg*2 of weight reduction. Achieved the lowest fuel consumption among non-hybrid gasoline vehicle in Japan*4 of 37.0km/L*3 mainly owing to major improvement of the engine, enhanced efficiency of CVT, and reduction of running resistance. Achieved weight reduction by renewal of a platform and major improvement in rigidity and quietness, collision performance, driving performance, etc. Secured enough body rigidity with fewer parts by making a smooth platform shape to reduce reinforcement parts and reducing the sheet thickness while joining basic cross-section. Major improvement in fuel efficiency by raising the compression ratio and adopting the EGR (Exhaust Gas Recirculation) system (excludes F 5MT and VP variants), while enhancing the low-to-mid speed driving performance by newly designing the intake and exhaust systems. Realized weight reduction and compact body by adopting a cylinder head integrated with an exhaust manifold and simplifying the catalyzer case. Combined weight reduction and high rigidity by making the suspension frame into a flat structure, and making it a part of the body frame. Improved riding comfort by expanding the front and rear suspension strokes. Adopted stabilizer on the front and rear (for X 2WD variant). Newly adopted torsion beam suspension on the rear, which contributes to weight reduction (for 2WD). 2. Achieved weight reduction of 60kg*2 as compared to the conventional model. Realized the lightest weight*6 of 610kg*7. Achieved weight reduction of 60kg*2 as compared to the conventional model by thoroughly reducing weight in the body, engine, suspensions, and seats, as well as adopting a new platform. Adopted high-tensile steel on 46% of the whole body weight to ensure weight reduction and rigidity. 3. Simple, clean, and stylish design. Simple but beautiful proportion with dignity. Roofline that flows from the front to the rear with the overall height kept low. Design around the headlights that evokes emotional eyes. A total of 12 body color variation including new colors Pure Red and Chiffon Ivory Metallic, as well as grey two-tone back door options (for X variant). *VP variant comes only with the body color Superior White. Comfortable cabin space that combined design and function. Instrument panel on which a clearly defined straight line between the leftmost and rightmost points emphasizes the cabin’s roominess. Meter with the same image as the headlight design. Light blue-based seats with white piping (excludes VP variant). 4. Comfortable cabin space with the ease of driving. Realized long wheelbase of 2,460mm owing to the adoption of a new platform. Realized the longest cabin length in its class*5 of 2,040mm*8 and tandem distance of 900mm. It also ensures 620mm for the distance between the driver and the front passenger. Ease of optimizing driving position owing to equipment of tilt steering (for X variant) and driver seat lifter (for S and X variants). The front doors adopt a middle two-step stopper. Realized one of the smallest minimum turning radius in its class*5 of 4.2m*9. Various storage space including a front console drink holder which can even hold a 500ml drink package (excludes 5MT), and a shopping hook behind the passenger seat which can hook a bag (excludes VP variant). *8 Variants equipped with rear seat head rests. *9 Variants equipped with 13-inch tires. 5. Incorporated advanced safety technologies. Radar Brake Support offer for all variants. *Radar Brake Support collision-mitigation braking system, unintended start control system, and emergency stop signal. Standard equipment of ESP(R) (Electronic Stability Program) which controls slipping and side sliding on all variants of passenger vehicle. Adopted light, impact-absorbent Total Effective Control Technology (TECT) body structure that efficiently absorbs and disperses impact forces. Equipped with Hill Hold Control, which controls the vehicle from backing down in a slope. *VP variant is equipped on vehicles with Radar Brake Support. Standard equipment of seatbelt reminder on both driver and front passenger seats of all variants of passenger vehicle. Available with both 2WD and 4WD, the Alto Turbo RS comes with the engine of 3-cylinder DOHC with a displacement of 0.66cc, just like the kei car regulations dictate. The output is 64 hp and 95 Nm from 3,000 rpm.Performance upgrades also include stiffer suspension, 13-inch front discs, bucket seats with integrated headrests and a revised steering system. The little pocket rocket only weighs 670 kilograms or 720 kg in the case of the AWD model. That makes it about 30% lighter than a European A-segment car. And did we mention the Suzuki is tiny? From bumper to bumper, it measures 3,395 mm and its overall width of 1,475mm should make it maneuverable around busy Tokyo streets. 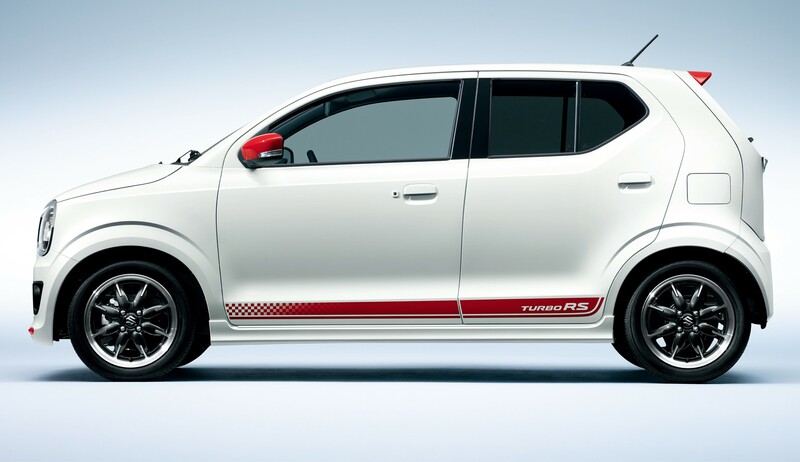 A number of cosmetic changes are there to let you know the Alto Turbo RS packs more punch. The headlights have been garnished in chrome trim, the power front bumper is red and so are the mirrors. 17-inch black alloys are fitted as standard with 165/55 R15 75V Bridgestone tires. Around the back, a red spoiler and extra stripes add curb appeal. Equipped with a turbo engine, the new Alto turbo RS to enhanced sports performance, concept model equipped with Recaro seats and 17 inches aluminum wheels, tuned specially under body. It is a model that proposes fun to manipulate with a sharp response and high cornering performance. Concept model that employs a black pearl two-tone roof color to body color of yellow metallic, was active in representing the sporty image. Lower the vehicle height, wearing 17-inch aluminum wheels and plated parts, can be customized more sporty.